You’re looking for a bit about me, the creator, right? Well yeah, my name is Lucy Middleton and I’m a typical Scottish teenager. I can only do creative things – art, drama, music, writing – but when it comes to maths and science, I’m hopeless. So I decided, lets work on something I’m good at. Let’s see if I can achieve something with what I can do! What else makes me a nerd? Well my favourite TV programs are Doctor Who, Merlin and Primeval. I’m the kind of girl who’s more content living in the fantasy world created by her superiors and would be happy to stay there forever. But then I’m also a fan of Anime/Manga. That’s where Oki comes into my story. I LOVE drawing anime and I’m pretty good at it, however, I struggle to draw the same person twice. So I thought, maybe I should start off with something simpler. I tried to think of something, but nothing came to mind. It got to the point I thought I was just going to have to stick to what I’d already been doing – Drawing individual images every time. 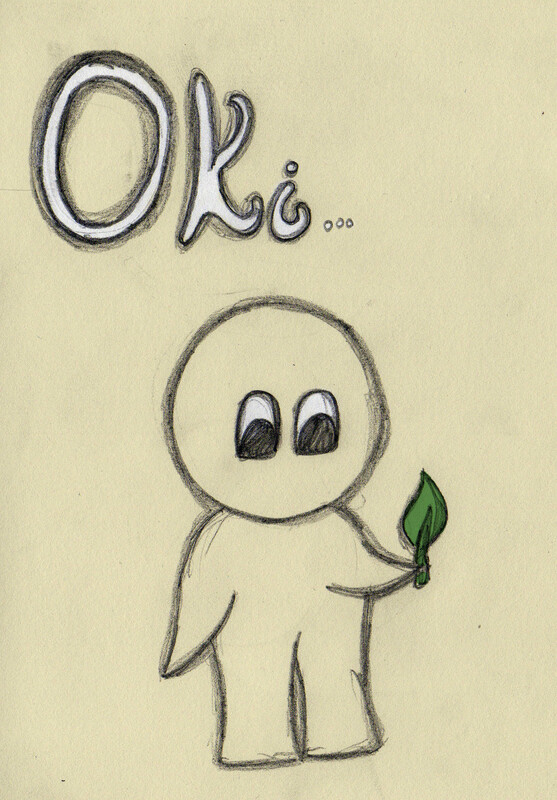 Then suddenly, while I was lying in my bed late at night, doodling in my sketch pad, the idea of Oki came to me . Once I’d drawn him once, I suddenly realised how easy he was to draw again, so I started putting him into lots of different scenarios. I discovered I could make him do whatever I liked! So I hope you enjoy my blog! I will TRY to update it regularly and aim to have about one picture a day, okay? Yes. Good. If you read all of that, I salute you and you can have another cookie 🙂 Omnomnom… Now I wanna cookie! What Do We Have Here?